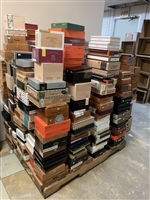 Are you looking for a gift for your favorite aficionado but you aren't sure what to buy? Here's a motley crew of odds & ends that'll make any smokers life easier! 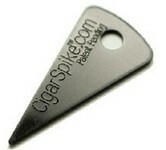 Cigar Spike - It looks and feels like a guitar pick... But it's a Cigar Spike! Cigar Spike is meant to be pushed down into the closed head of a cigar to create a small draft hole for you to smoke out of - leaving the cap of the cigar undisturbed! It features a handy key-ring hole so you can attach it that way and never leave home without a cigar "cutter" again! Stage V Clinger Cigar Holder (Blue) - Constructed of powder coated spring steel, using both a velcro wrap-around and neodymium magnets, accepting up to a 70RG cigar, and with a hilarious name - fans of Wedding Crashers will get the joke - this versatile cigar holder is perfect for just about every application. Attach it to your golf cart or golf bag, to the bench in your workshop, or anywhere you'd need a secure third hand to hold your stogie! Heck, we've even seen people attach these to the roll bar in their open-air Jeep Wranglers! Stage V Clinger Cigar Holder (Orange) - Constructed of powder coated spring steel, using both a velcro wrap-around and neodymium magnets, accepting up to a 70RG cigar, and with a hilarious name - fans of Wedding Crashers will get the joke - this versatile cigar holder is perfect for just about every application. Attach it to your golf cart or golf bag, to the bench in your workshop, or anywhere you'd need a secure third hand to hold your stogie! Heck, we've even seen people attach these to the roll bar in their open-air Jeep Wranglers! Stage V Clinger Cigar Holder (Red) - Constructed of powder coated spring steel, using both a velcro wrap-around and neodymium magnets, accepting up to a 70RG cigar, and with a hilarious name - fans of Wedding Crashers will get the joke - this versatile cigar holder is perfect for just about every application. Attach it to your golf cart or golf bag, to the bench in your workshop, or anywhere you'd need a secure third hand to hold your stogie! Heck, we've even seen people attach these to the roll bar in their open-air Jeep Wranglers! Stage V Clinger Cigar Holder (White) - Constructed of powder coated spring steel, using both a velcro wrap-around and neodymium magnets, accepting up to a 70RG cigar, and with a hilarious name - fans of Wedding Crashers will get the joke - this versatile cigar holder is perfect for just about every application. Attach it to your golf cart or golf bag, to the bench in your workshop, or anywhere you'd need a secure third hand to hold your stogie! Heck, we've even seen people attach these to the roll bar in their open-air Jeep Wranglers! Zippo Hand Warmer - Perfect for enjoying your cigar or pipe when the temperature drops, as well as during hunting season, taking the dogs for a walk, watching your favorite sporting event or even just going for a hike! Zippo's high polish chrome Hand Warmer features a thin design that easily slides into your pocket and stays warm for up to 12 hours. The Zippo Hand Warmer comes with Zippo fuel, a filler cup and warming bag, so it's ready to go right out of the package!